Join us for an Afro-futurism celebration of Black History inspired by the by the popularity of the record-breaking Black Panther movie. Based on the fictional African country of Wakanda, the movie has become an instant cultural phenomenon highlighting the infinite possibilities in Science, Technology, Engineering and Math (STEM). 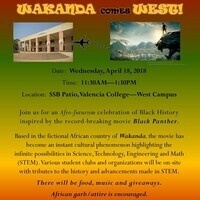 Various clubs, organizations and businesses will be on-site that are related to STEM and/or African American culture. There will be food, music, giveaways and more. We are also encouraging everyone to wear your African garb/attire or your Marvel comic shirts/costume to fit the theme of the event! You may even win a prize for being best dressed! With the end of Spring term quickly approaching, we would like students to have an opportunity to take a short break to eat, learn and enjoy yourselves as you successfully finish your courses strong.